Frederic Leighton's first trip to an Islamic country was to Algeria in 1857. He would later write 'this visit made a deep impression on me. I have loved the East as it is called ever since'. Although Leighton never specifically tells us what made him love 'the East', there are some hints in his letters home to family members. He describes the diversity of the populations, the colours of the landscapes and the climatic conditions of these distant countries. However, it would be wrong to assume that Leighton's trips were excursions to new alien environments never before seen by an Englishman. The reality is that Leighton would have seen much that was familiar to him as a westerner on these journeys. 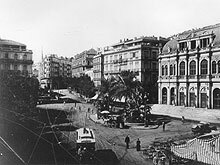 An excellent example is his description of Algiers, capital city of Algeria - 'the whole of the lower part of the town that runs along the port has been so completely Europeanised that, but for a rather pretty mosque on the waterside, you might fancy you were at Le Harve or any other French seaport town'. It is no coincidence that Leighton should mention a 'French seaport' as Algeria had been invaded by French forces in 1830 (the year of Leighton's birth). The year 1830 holds an important place in modern history as for many people it represents the beginning of sustained European interest and colonisation of much of North Africa and the Middle East. Therefore, by the time of Leighton's arrival in Algeria in 1857, the country had already been a colony of France for twenty-seven years. Leighton as a fluent French speaker would not have encountered many obstacles on his arrival and would have had the support of the French colonial government. Although Algeria had become a colony of France in 1830, Leighton would have known that it once was, and that most of North Africa and the Middle East still were, under the control of the Ottoman Empire. The exception to this was Persia (modern day Iran), which was ruled by the Qajar dynasty (1781-1925) with their capital at Tehran. The Ottomans were frequently at war with Persia over control of the Middle East. Morocco was also outside Ottoman control, being ruled by a family called the Alaouite's (1664-present). The Ottomans (Osmanlis in Turkish) were a powerful family that emerged in Turkey in the 1300s and by 1517 had conquered much of the Middle East and North Africa. The Ottoman Empire lasted until 1918 when it collapsed after World War I. The Ottoman capital city was Istanbul and the head of this vast empire was known as the sultan (which means 'holder of power'). 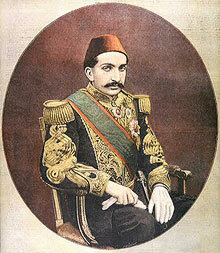 The ruling sultan during most of Leighton's lifetime was Abdul Hamid II (1842-1918). Leighton visited Istanbul in 1867 and would have known that in that same year Queen Victoria received the first visit of an Ottoman Sultan to Buckingham Palace. Such contacts between the rulers of east and west were not new by this time. The first Ottoman diplomatic mission to London took place in 1793. By the end of the 1800s the Ottomans had embassies in most major European countries. Similarily, European countries had embassies in Istanbul. With such a vast region of the world under Ottoman control, the main problem for the sultan and his advisors was how to keep the various countries and their mix of peoples and religions living in harmony and loyal to him. The Muslim Ottoman Empire was composed of various strands of Islamic, Jewish, Christian and Persian beliefs. The way the Ottomans achieved a sense of harmony amongst all this diversity was to allow each religious and ethnic group a degree of independence to live according to their own customs and religions. This was called the 'millet system'. However, each group recognised the sultan as the supreme ruler and Islam as the first religion of the empire. As part of this agreement non-Muslim groups within the empire were taxed at a higher rate than their fellow Muslim citizens. Countries that were located near to Turkey such as Syria and what is now modern day Israel and Palestine were ruled directly by the sultan. Their close proximity to Istanbul made this possible but also the sultan wanted to be seen as the protector of Islam's holy sites in that area. However, it was impossible for the sultan to rule all of the Ottoman empire from Istanbul so he appointed regional governors to do the job for him. Over time, these regional governors became increasingly powerful. Although they proclaimed loyalty to the sultan, they were always keen to protect their own interests. Some of the most powerful regional families of the nineteenth century ruled in Egypt, Algeria and Tunisia. On occasion these governors actually went to war against the sultan in attempts to extend their power. The most famous example of this occurred in 1831 when Muhammad Ali of Egypt rebelled against the Ottomans. His Egyptian forces invaded Syria and were ready to attack Turkey and Istanbul itself before Russia came to the assistance of the sultan and negotiated a peace deal. For more information on European involvement in the Middle East in the nineteenth century please see the article: Britain's relationship with the Middle East in the 1800's. Who ruled the Middle East in Leighton's time? How was life different from Victorian Britain? How did these regions of the world interact? Where did Leighton travel to? What was travelling like in the 19th century? Who else was travelling between East and West and why? What did Leighton collect during his travels? How did museums collect in the 19th century?